Oct 29 When your flight arrives, you'll be picked up at the airport and brought to our beautiful guest house. You can settle in, unpack, have a snack, and rest before dinner. Over our evening meal, we will debrief about the week ahead, ending our night with offerings for the spirits and ancestors of the land. Please bring items to add to the community altar as well as coins or crystals as offerings. 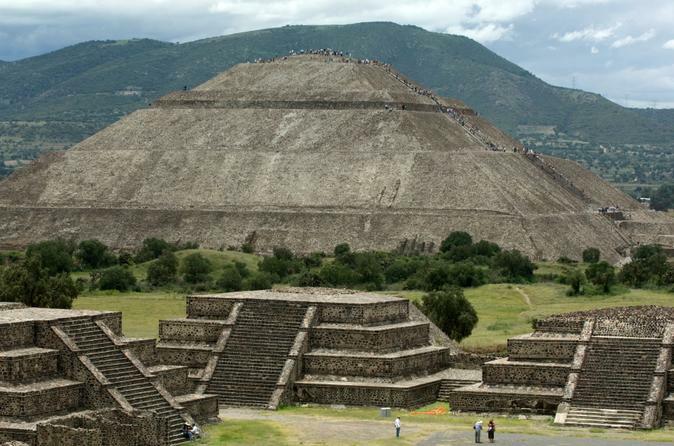 Oct 30 We will rise early and travel to the Pyramids of Teotihuacán, 25 miles north of Mexico City. Teotihuacán began as a religious centre in the Mexican Highlands around the first century AD. The early history of Teotihuacán is quite mysterious, and the origin of its founders is uncertain. Its name means "birthplace of the gods" in Nahautl language. Oct 30 After our visit to the Pyramids of Teotihuacán, we will stop to see the Basilica de Nuestra Señora de Guadalupe, where we can offer our prayers to the Black Madonna of Mexico. The new Basilica houses the original tilma (or cloak) of Juan Diego, which holds the image of Our Lady of Guadalupe. Oct 30 On our way home from the Pyramids of Teotihuacán & Basilica, we will stop to see the giant statue and fountain of Diana the Huntress. Actually titled, "The Northern Star Shooter," this statue was built in 1942 and symbolizes honor for beauty, women, and the human body. Bring some coins, crystals, or other small items to leave as offerings. Oct 31 On Halloween morning we will head out early to the Mercado de Sonora, an open-air market renowned for witchcraft and occult supplies, readings, and rituals. There, we can procure supplies for our Hallows ceremony, receive a divination or cleansing, and explore the booths and stalls with over 400 people offering their wares. Oct 31 After the Witch Market, we'll head to the Museo Frida Kahlo for an afternoon of connection with this beloved ancestor and her historical objects. This museum, in her former home Casa Azul, holds some of Frida's paintings and many of her personal effects. A popular exhibit onsite features her dresses and clothing. Oct 31 After dinner, we will gather at our community altar for a Hallows ceremony honoring the beloved dead. We will begin with a silent supper, and then perform a sacred ritual, asking for messages from the goddesses, receiving divinations, and memorializing the benevolent and brave dead of the land and of our lineages. Afterwards, we'll relax with tequila and dessert. Nov 1 On Dia de los Inocentes, our group will visit Tepito, where there is a significant open-air shrine to Santa Muerte. We will bring candles and offerings to give to the Skeleton Saint, and spend some time at her altar before heading to the Zocalo, where there will be lunch, Aztec dance, offerings of copal smoke, and Dia de los Muertos activities. Nov 1 After our tour of the Santa Muerte shrine and Zocalo, we will visit the Templo Mayor, an ancient Aztec (Mexica) ruin with statues and artifacts honoring a multitude of different deities. According to tradition, the Templo Mayor is located on the exact spot where the god Huitzilopochtli gave the Mexica people his sign that they had reached the promised land: an eagle on a nopal cactus with a snake in its mouth. The various levels of the Temple represent the cosmology of the Aztec world. Nov 2 This is one of the liveliest places to celebrate Dia de Los Muertos. It is a 3-hour drive from Mexico City to Mixquic, where the churches and cemetery are filled with people celebrating. With sensitivity toward those honoring their dead, we will tour the town and enjoy the festive aspects of this holy day before coming home late at night. Nov 3 The site of the Museo Dolores Almedo originally dates from the sixteenth century. The restored buildings have gardens with trees, bushes, plants and flowers, some of them unique to the Xochimilco area, inhabited by geese, ducks , peacocks, native turkeys and Mexican hairless Xoloitzcuintle dogs. The museum houses 25 Frida Kahlo paintings. Nov 3 Depending on what we have seen and experienced during our week in Mexico City, we will have the opportunity to loop back and visit a market or site we have already visited, or to go to a new market or sight-seeing area. We intentionally are leaving this afternoon blank on our schedule so that the group can decide what we want to do together. Nov 4 We will drive to the airport and fly home. If you'd like to extend your stay in Mexico City, you will need to make private arrangements. *This itinerary has been confirmed with our agent, but may be subject to slight changes due to unforseen conditions. 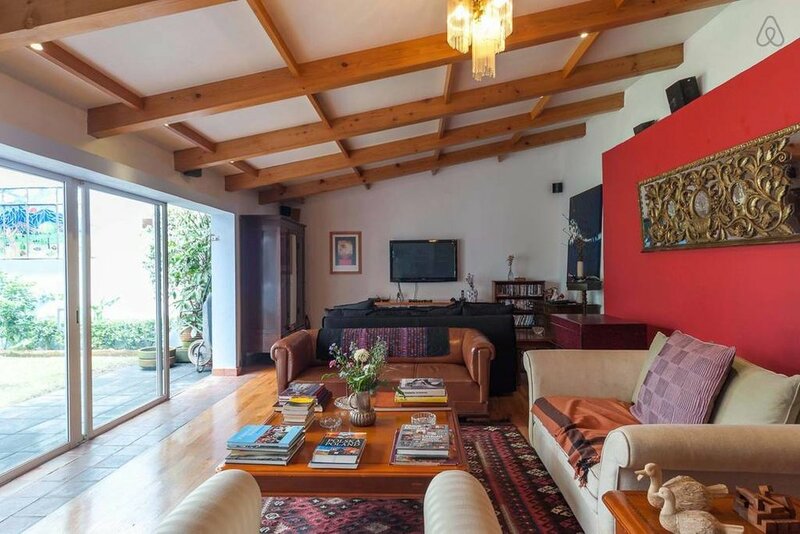 We will be staying at a beautiful guest house in San Miguel Chapultepec, an arts and shopping district with galleries, restaurants, and local sights. Although we will be out touring for the majority of each day, we will usually end up at home for dinner and ceremony, reading, or quiet time in the evenings. If we feel like exploring, we can visit local cantinas for drinks, get ice cream, or walk around the neighborhood. Our experienced hosts Francisco and Maria will provide guidance, advice about touring, and connections with our driver, translator/guide, and a cook to prepare us dinner each day. Prices for this trip are based on double occupancy for each room, with a total of 8-10 guests on the trip. Sleeping arrangements may include a shared bed in some cases, so couples and friends are encouraged to sign up together. However, if you are coming solo, we will pair you with someone who will match your roommate needs after an interview process, and connect you with your roommate to communicate ahead of time so you won't be strangers when you arrive. Additionally, there are lots of comfy couches throughout the house, so if you want to tuck yourself in somewhere on your own, you will be able to do that. There is one single occupancy space available. The house has two levels and multiple areas for sitting and conversing, having a drink, reading, looking at tarot cards, or just communing with the spirits. Take a peek at the slideshow below for photos of our guest house. Your trip fee includes 2 meals per day: breakfast and dinner. Every day, breakfast items will be provided including gluten-free and regular cereal, milk, vegan options, eggs, toast, coffee, tea, and fruit. You are welcome to cook and eat breakfast on your own or communally, as you wish. Lunch is your responsibility, and will typically occur while we are out sightseeing. You are welcome to bring items to make your own brown bag lunches, or to purchase lunches at restaurants and food carts. Most nights, we will have dinner at home, prepared by the cook who works for our hosts. We will definitely be eating dinner out when we are in Mixquic for Dia de Los Muertos. You will be responsible for either purchasing your own bottled water or bringing your own water bottle with a powerful filter. Here are some tips to help you stay healthy regarding water quality in Mexico. The Early Bird price for this trip, available until April 1, is $1200 per person based on double occupancy. For single occupancy (only one available) the price is $2000. If you'd like to book, please see below. Personal expenses—bottled water, medicines, offerings at sacred sites. 1. Please read Terms of Service carefully. When you're ready to proceed, pay your USD $1200 trip fee below to reserve your space. 2. We will pick you up at the Mexico City Airport on October 29. If you arrive earlier, your overnight lodging at an airport hotel or in the city and transportation to and from the house are your own responsibility. 3. When your fee is received, you will be contacted by email to schedule a video meeting with Priestess Yeshe. The purpose of this meeting is to answer any questions you may have and to share information. 4. If you cannot pay the entire $1200 fee up front, please contact yeshematthews@gmail.com to discuss a payment plan. 5. You will receive health and travel guidelines, currency and insurance information, a packing list, and suggestions for making the most of your pilgrimage. 6. If the pilgrimage is cancelled due to unforeseen circumstances in Mexico or the US, your deposit or trip fee will be refunded 98%, with 2% held to compensate for non-refundable fees we encounter during planning. Cancelling international flights will be your responsibility. 7. If you wish to cancel your booking, please inform us as early as possible. Your deposit will be refunded 100% if your space can be filled by July 1, 2018. Cancellations after July 1 are not refundable or may only be partially refundable if we cannot fill your space. We regret we cannot be more flexible with last-minute refunds, even in the case of emergency. 8. Responsibility Clause: The Mt Shasta Goddess Temple acts solely as a tour guide for this trip. We are not responsible or liable for problems arising in flights, transportation, itinerary changes or circumstances beyond our control in Mexico City, nor for any loss, injury or damage to your person or property, nor for any delays in transportation. We reserve the right to cancel the trip or any part of it, to alter the itinerary if necessary or desirable, to refuse to retain any trip member at any time, and to pass on to trip members any unexpected expenses incurred through events beyond our control.